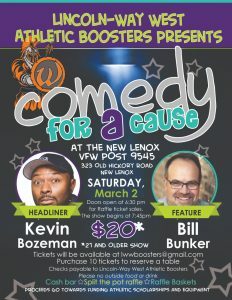 We will be hosting our 6th annual Comedy for a Cause on Saturday, March 2, 2019 at the New Lenox VFW Post 9545 located at 323 Old Hickory Road, New Lenox. Doors will open at 6:30 pm and the show begins at 7:45 pm. This is a 21 and over show and will have a cash bar, split the pot and basket raffles. The proceeds from this event will go towards funding Lincoln-Way West Athletic Booster scholarships and equipment for all athletic programs. We will have two very talented and funny comedians. We can reserve tables of 10 for $200.00 or individual tickets are $20.00. If interested, please contact lwwboosters@gmail.com for your tickets or buy them at the door.